Democratic presidential candidate Bernie Sanders is catching up - and even surpassing - Hillary Clinton in some polls. What are the Vermont senator's policies and beliefs? 1. He is a socialist. Sanders is running as a "Democratic socialist", but in his long political career he became comfortable with just "socialist" ("I am a socialist and everyone knows it," he once said.) He frames his political ideology this way: "Democratic socialism means that we must create an economy that works for all, not just the very wealthy." His fight for equal treatment of the poor and middle class and against the "billionaire class" is a central tenet of his campaign, and the socialist mantle has positioned him further left of centre than Clinton. 2. Climate change is real. After the National Oceanic and Atmospheric Administration marked 2015 as the hottest year on record, Sanders tweeted: "The debate is over. Climate change is real and caused by human activity." He wants to tax carbon emissions, repeal fossil fuel subsidies and invest in clean energy technology. He has opposed the Bakken and Keystone XL oil pipelines. 3. College should be free. "A college degree is the new high school diploma," Sanders wrote in a Washington Post opinion piece, arguing that class equality is impossible if a majority of Americans don't have access to a college education. He has introduced a plan to make tuition at public universities and colleges free by taxing Wall Street speculators. 4. Gun ownership is a "lifestyle that should not be condemned". Sanders' record on gun control has been mixed which he says is due to the fact that his constituents in Vermont are pro-gun and "99 percent of the people in my state who hunt are law abiding people". He supports universal background checks, but prefers to talk about reaching "common ground" when it comes to gun policies rather than sweeping new gun control regulation. 5. Black lives matter. Though Sanders was shouted down at his own campaign event by members of the Black Lives Matter group, he has since met activists and agrees that the high rate of unemployment and incarceration for African Americans is evidence of systemic racism in the US. He touts criminal justice reform as the answer to some of these issues. 6. He will not accept super PAC money. Sanders prides himself on the fact that his donors are mostly individuals and the average contribution to his campaign in the most recent quarter was just $27. He characterises the controversial Citizens United Supreme Court decision as "disastrous" and blames it for flooding the US political system with cash from special interest groups. "I do not believe that billionaires should be able to buy politicians," he told the Washington Post. 7. The minimum wage should be $15 (£10.59) per hour, up from $7.25. Sanders argues that no one who works 40 hours a week should be impoverished, however, some economists from both sides of the political spectrum are concerned that such a dramatic increase could have unintended consequences for poorer cities and struggling businesses. 8. Americans are tired of the two-party system. For decades, Sanders has railed against both the Democratic and Republican parties, saying they are too beholden to corporate money. 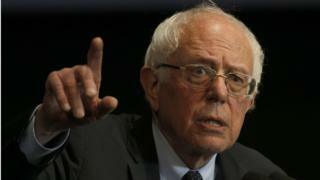 Sanders was elected to the Senate as an independent, and some have said his rejection of both parties left him bereft of allies and ineffectual. Sanders argues his outsider status is what has driven his grassroots campaign. 9. He prefers to fly economy. Pictures of Sanders flying in the rear of regular commercial airline flights have gone viral and supporters have seized on the practice with hashtags like #SandersOnAPlane to show that Sanders is a humble everyman who would safeguard taxpayer money. Some of the candid shots of Sanders working in the middle seat have inspired memes juxtaposed with Clinton or Donald Trump boarding private aircrafts. 10. The US should adopt universal healthcare paid for by the federal government. Sanders has often spoken of his admiration for government-run healthcare systems in Canada and Scandinavian countries. "Bernie's plan means no more co-pays, no more deductibles and no more fighting with insurance companies when they fail to pay for charges," his website promises. He means to finance it mostly from a payroll tax hike. 11. $1 trillion should be spent on infrastructure. Sanders wants to create jobs by investing heavily in new infrastructure projects that he says will create 13 million jobs over the course of five years. His "Rebuild America Act" would put that money into roads, bridges, water treatment systems, railways and airport projects - and comes with a $1 trillion price tag. 12. Tax the rich. Sanders wants to pay for his most sweeping proposals with a series of tax hikes and fees, mostly levelled at the wealthiest of Americans: hedge fund managers, Wall Street speculators and big businesses. 13. There should never have been a US-led war in Iraq. Sanders voted against the US invasion of Iraq in 2002 and says today that he stands by that decision. He calls it the "worst foreign policy blunder in the history of this country". 14. No boots on the ground in Syria or to fight IS. Sanders has a diplomacy-first attitude towards foreign policy and believes that Middle Eastern countries must lead the fight in their own region against the self-styled Islamic State group. 15. Personal style is a waste of time. While the Obamas are said to be the most stylish presidential couple since the Kennedys, a Sanders White House will be decidedly more frumpy. Sanders' wife Jane O'Meara once quipped that if he has "seven sweaters, that's three too many for him". When questioned about his frequently-rumpled hair, Sanders was brusque: "The media will very often spend more time worrying about hair than the fact that we're the only major country on earth that doesn't guarantee healthcare to all people." 16. He likes to go by "Bernie". While campaigning in his home state of Vermont, Sanders' bumper stickers just said "Bernie". "You have to reach a certain exulted status in politics to be referred to only by your first name," Senator Patrick Leahy told the New York Times in 2007. 17. He would love to run against Donald Trump. "I have to tell you," he said at a recent news conference, "on a very personal level, it would give me a great deal of satisfaction to run against Donald Trump".